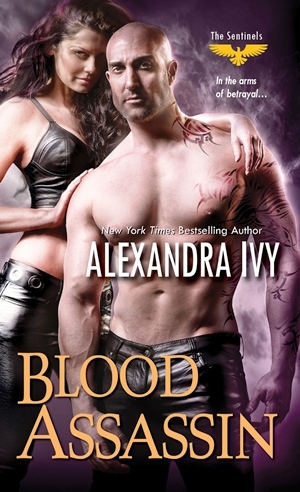 After reading Born in Blood, I could not pass up an opportunity to read Blood Assassin and it was worth my time. Serra and Fane’s attraction to each other is the worst-kept secret in Valhalla and even though Serra has has thrown herself at Fane countless times, he has never taken her up on her offer and she decides that she is done chasing after a man who would not acknowledge her or his feelings for her. Fane is a highly trained and legendary sentinel and has dedicated his life to his duty as a guardian. Now that guardianship of his charge Callie has been transferred to Duncan, he has decided to return to the monastery as trainer. Fane knows that Serra is the only woman that will ever hold his heart, but his rejection of her is due to his responsibilities as a guardian. When Serra is in danger, he drops the barriers he put up against her and rushes to her rescue, but the constant rejection from Fane has affected her ability to trust him and he has a battle on his hand trying to convince her that his feelings are real. If you love strong and spirited women, then you would love Serra. She is that and more – larger than life, gorgeous, smart, independent, bold but above all, she knows her shoes!!! Come on, you’ve got to love a woman that knows her designers! I loved that she lived life on her own terms and was no pushover. Fane is very much a protector- tall, strong, tattooed and lethal but against this enemy his hands are tied, which does not go down well with him. Fane and Serra together are just perfect – passionate sexual encounters mixed with very sweet moments. In a first for me, I actually liked the villain and was rooting for him. Bas is a cunning criminal with a very broken moral compass and he demonstrates a chilling ruthlessness in the way he manipulates Serra into doing his bidding, but he is willing to use anyone and anything to save his child. As usual, Ms. Ivy gives us dramatic, action-packed scenes that draw us right in and make us feel like we are in the thick of the danger and excitement. The teasers about other potential story-lines give a glimpse of what promises to be an even more thrilling addition to the series. Blood Assassin is definitely one to read.